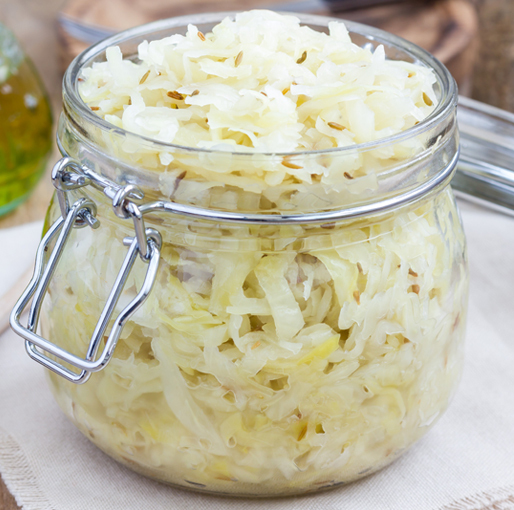 Modern Baker healthy chef Ashley Keen shares her delicious fermented cabbage (sauerkraut) and kraut juice recipe, and tips for fermenting. Modern Baker’s focus for National Vegetarian Week was to help revive the ancient technology of fermenting plant based foods for better health. The two best fermentations to master in your own kitchen are sourdough bread and sauerkraut. Of these, the sheer simplicity of making your own sauerkraut and the quick, delicious results makes it a great place to start. We have gallons of it bubbling away at Modern Baker as well as selling jars of it in our shop. It’s also a recurring ingredient in Modern Baker’s adventurous five-course Fermentation Feast menu (ever tried sauerkraut chocolate? or bread?) that popped-up at Soho Farmhouse. Fermenting foods was one of modern man’s key transforming technologies and a major trigger for the agricultural revolution 12,000 years ago. Natural fermentation converts the naturally present sugars into lactic acid that inhibits harmful bacteria and acts as a preservative. Beyond that, and arguably more important in today’s era of factory-based foods, fermentation creates probiotics that promote the growth of friendly intestinal bacteria, increase overall nutrition, aid digestion and support the immune function. In short, a powerful, natural medicine that tastes good too. Pull off any unusable outer leaves of the cabbage. Slice into quarters or eighthsif a large cabbage. Finely slice or mandolin the cabbage and put in a bowl. Sprinkle with two teaspoons of natural salt and massage it into the cabbage for a couple of minutes. Leave for 10 minutes and repeat massage. Tightly pack the cabbage and any liquid into a sterilised (instructions on how to do this below in tips) Kilner Jar (cliptop or fliptop). Really push it down with your fists and the natural juices will be squeezed out. All the cabbage must be covered in this juice to stop spoilage. Put a cabbage leaf or a cut out piece of plastic on top of the cabbage to keep it below the juice, if requires weight this down with a small glass or jar. Lower the lid but don’t fasten it, and leave on your kitchen surface. Keep an eye on it and push down any cabbage that escapes!You may see it bubbling after a day or so – don’t worry this is natural. After five days taste it and if fermented enough for your taste transfer to the fridge to stop fermentation. If not, leave it and check each day. Keep it sealed in your fridge for up to three months and drink a shot of any remaining kraut juice – it’s teeming with beneficial bacteria. To sterilise your jars: Heat your oven to 140 °C. Wash in very hot soapy water, place in the oven to dry for 20 minutes. This is the very basic recipe; garlic, spices and other vegetables can be added for variety. Browse a few online recipes and tips to broaden your knowledge and confidence. Delicious in sandwiches and salads, in coleslaw or on its own on sourdough toast! A Modern Baker favourite is combining Sauerkraut with grated apple, carrot, herbs and mayonnaise to create a tangy slaw to go in sandwiches or as a side dish. Take a tablespoon of kraut juice and add two teaspoons of salt to start fermenting other vegetables like beetroot, asparagus, carrots or celeriac.